Abfraction: What Is It and How Can It Be Treated? Here at Cosmetic Dentistry of New Mexico, we always strive to enhance the beauty and health of smiles while also empowering patients with knowledge. This allows patients to make smart choices about their dental care needs and what they can do at home to maintain good dental health. This focus on the patient is what has made us on of the leading cosmetic, general, and restorative dentistry practices in Albuquerque. With this in mind, we want to consider a dental health issue known as abfraction. It's not well known to many patients, but as you are about to read, you may have experienced abfraction already and simply did not know the name. Abfraction refers to small notches that form on the teeth where the tooth structure meets the gumline. This notch occurs because of the loss of tooth structure over time. The notch may be sharp in some cases, though brushing your teeth can cause these notches in tooth structure to become rounded out and smoother. 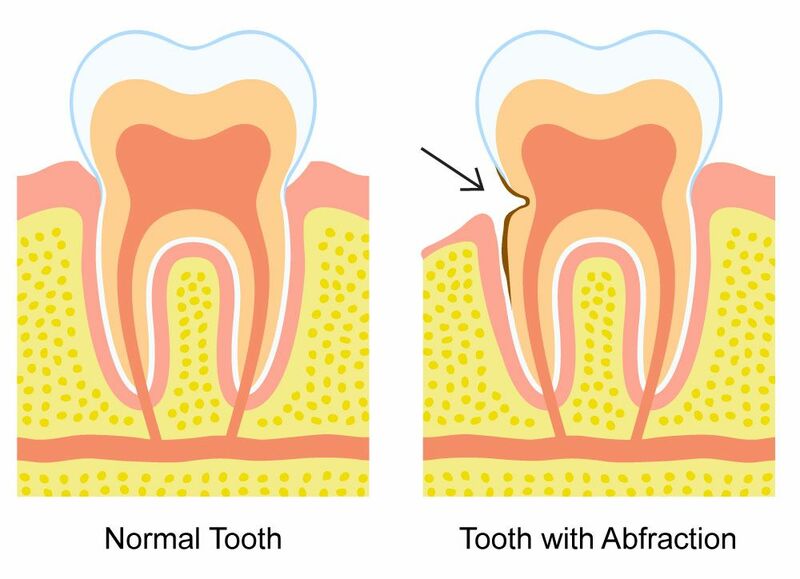 The term “abfraction” was first coined in 1991 as a way of discussing these kinds of unique hard-tissue lesions that are not the result of tooth decay or tooth injury in any traditional sense. What's interesting about abfraction is the apparent cause of these lesions. Dental health professionals believe that these notches in the tooth structure occur as a result of forces that are normally exerted on the teeth over a long period of time. The most common signs and symptoms of abfraction are those odd notches that you can feel with your tongue or perhaps see in a mirror. Sometimes these notches can contribute to cases of tooth sensitivity and gum irritation. Ever since the term was first used, dentists and researchers have disputed the nature of these notches and what their actual causes may be. Some dental care professionals believe that other factors and forces are at work with regard to these hard-tissue lesions. The debate continues, and we'll revisit the notion of abfraction as more information and research is done. This is a matter that's of concern to us, and should be of concern to you, as we're sure you may have noticed those odd notches on your teeth at some point. The best way to deal with abfraction is to use a tooth-colored dental filling. This will help rebuild the missing tooth structure and avoid potential problems later down the road. Since the filling is color-matched to the tooth, it is difficult to notice and will yield excellent cosmetic and restorative results in the process. For more information about abfraction and other dental health issues that can affect total wellness, be sure to contact our cosmetic and restorative dentistry center today. The team at Cosmetic Dentistry of New Mexico looks forward to your visit and helping you achieve a healthy and beautiful smile.